I can’t claim this idea, I took it and tweaked it from one of my Do It Yourself Magazines (aka my bible). I would take a picture of the page to show you the inspiration, but to be honest I can’t find it. I made this shower curtain like a year ago and just haven’t had the urge to post it until now. On the plus side, all these pictures were taken over a year after it was made and you can see how well it is holding up, and my husband takes a LOT of showers. I am not sure if the paint went through the shower curtain, but I was worried about it so I laid down a layer of trash bags before I laid the shower curtain down on top. 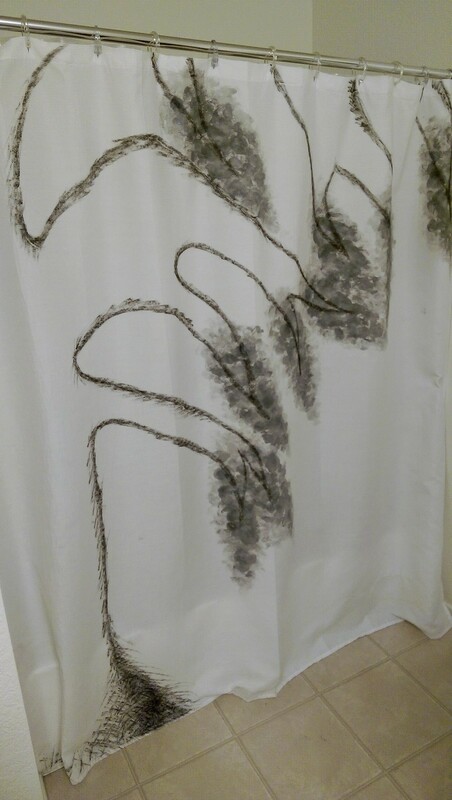 I am no artist, so I drew the tree on a piece of paper first, and then I drew the tree on the shower curtain in pencil. 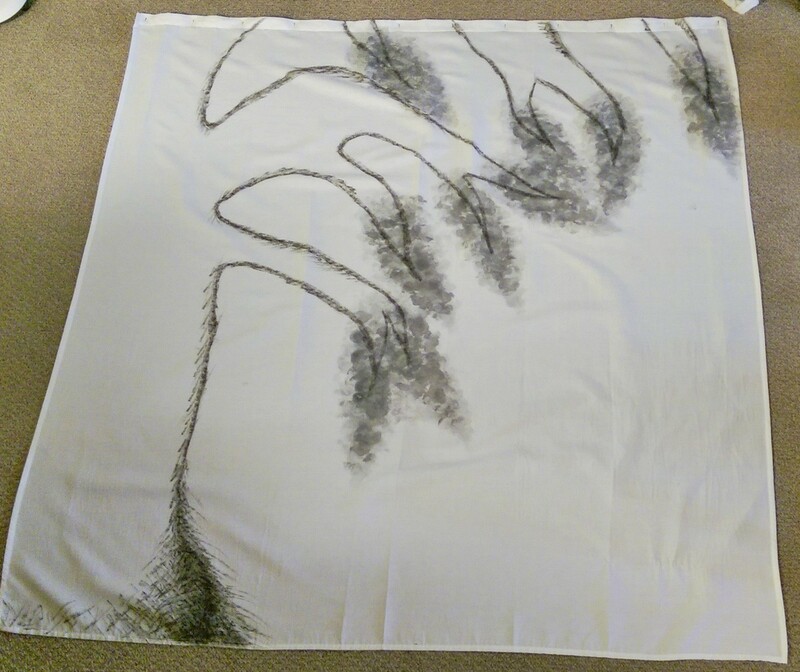 Then I used the fabric pen to draw the tree on the curtain, and I still effed it up. I like to follow the motto of “only happy accidents” so I kept going with the mistakes I was making (like the dang tree trunk), but whatever. In order to get the water color effect, put about equal parts paint and water into a cup and mix. Keep adjusting the ratio until you get the consistency you want. You want to see through the paint once it is painted on the curtain, and I had to keep adjusting the ratio while painting and adding more water until I got that “watercolor” effect. Leave the curtain out to dry for a few hours. Then hang and enjoy!! Curtain laying on the ground, I think it looks better when it is hung and the folds add to the leaves. Do It Yourself Example: The example in the magazine was quite different, but equally cute. 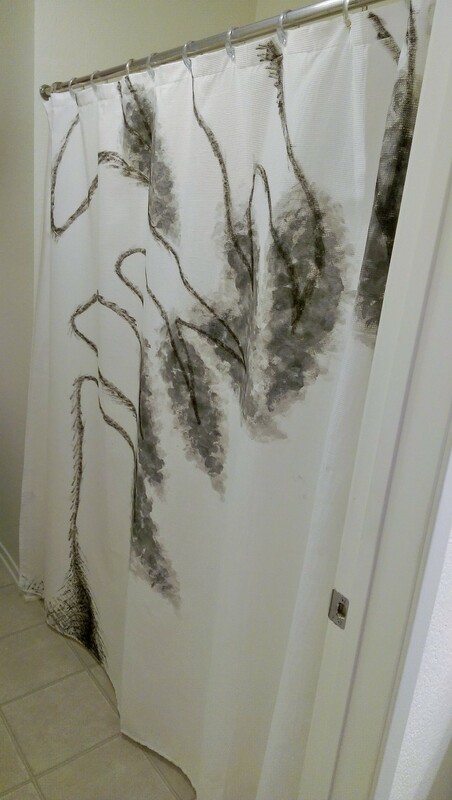 They drew large flower outlines on the shower curtain with the black fabric marker. Then they used reds and pinks and oranges to watercolor paint inside the flower outlines. They let the paint bleed out of the lines to add to the watercolor effect. I may try this idea with our guest bathroom later on. Stay tuned…. Hung the curtain in the guest bathroom so there is more room to see it in its full glory. Lighter color paint? Absolutely! The example I saw in the magazine was with reds and pinks and they were quite diluted. It was lovely!